Splitting Up! What Would Lucy Do? It’s fairly common to feel a little lost after a regular ol’ breakup, so it’s not hard to assume what a big ol’ divorce might feel like. It’s a long process that requires multiple agreements (who gets what, who gets to see the kids when, etc.) and it can really take it out of you. Not everyone knows firsthand what a divorce is like (and thank goodness for that! ), but we know enough from friends or family members or even just entertainment portrayal of a divorce to know that it’s a confusing, frustrating, and emotionally draining time. Some people end it on a fairly cordial, mutual agreement, so their healing time may be a little quicker than normal, but many people end up stressed with new financial burdens and responsibilities, and may get a little discouraged or give up on a long-time dream for other new commitments. But this isn’t healthy for anybody! 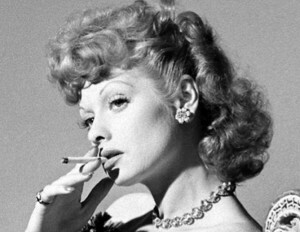 What would Lucille Ball do? In addition to being a famous film actress, model, and studio executive, Lucille went through her own major divorce from fellow I Love Lucy star Desi Arnaz in 1960. Despite the fact that the whole thing was less than enjoyable, Lucille maintained her position as a top studio executive of DesiLu Productions (her company shared with ex Desi) and went on to produce equally successful features (including We Love Lucy) that continued to rake in the dough. In addition to completely killin’ it in her career, she was a wonderful, caring mother to two children, which just goes to show that you don’t have to give up one facet of your life for another– you can have it all! Perhaps in response to questions on how she kept it cool after a divorce, Lucille was quoted saying, “One of the things I learned the hard way was that it doesn’t pay to get discouraged. Keeping busy and making optimism a way of life can restore your faith in yourself.” Whatever the case, this sounds like great advice to go by, no matter what obstacles are thrown your way. We really DO love Lucy!